Watch the first episode of ‘Made in Bali’, a mini-documentary series by NOW! Bali, focusing on Bali sea salt and one of its traditional farmers. 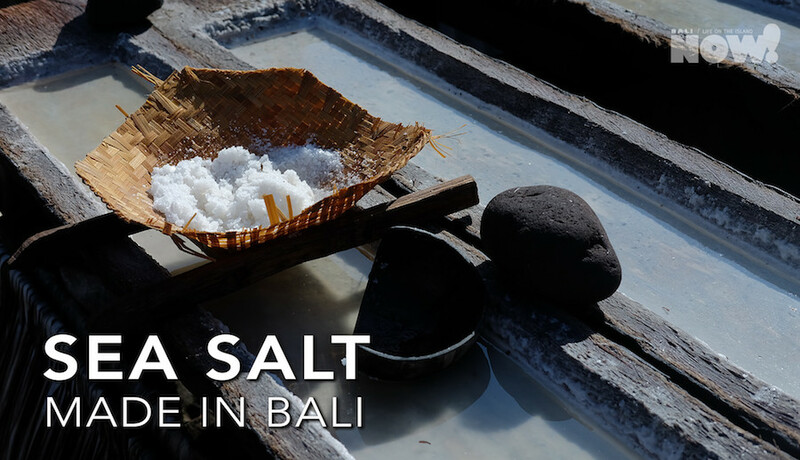 Bali sea salt is one of the lesser known produces made on the island. 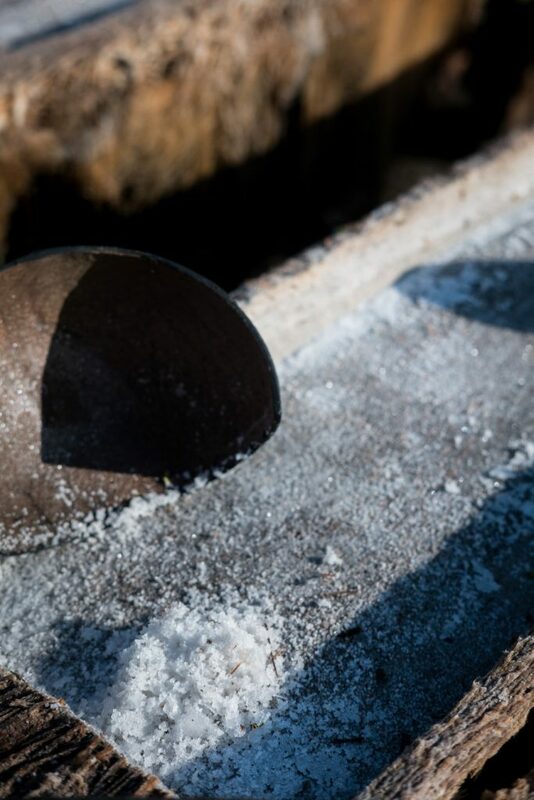 This artisanal salt is not being exported en masse at it continues to be farmed traditionally, at a small scale, by farmers implementing an ancient method of sea salt farming. 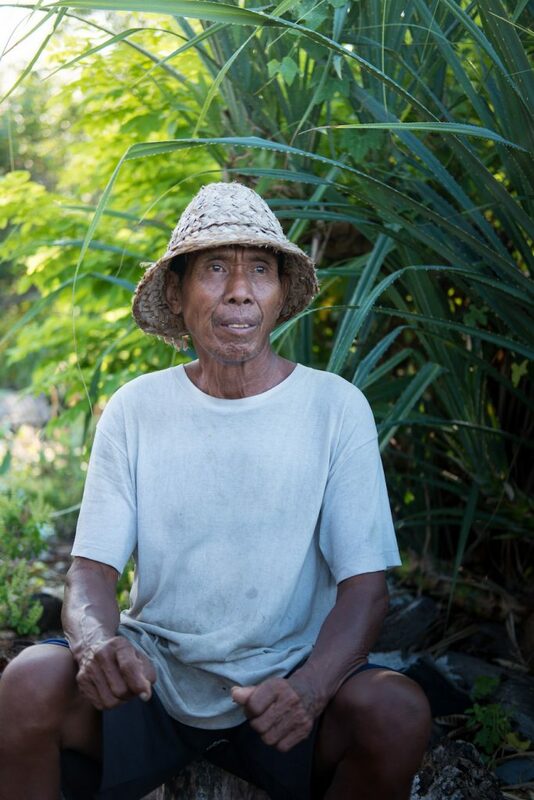 Nyoman Warta, is one of the few remaining Bali sea salt farmers. He starts his day early in the morning, walking down the black, volcanic sand beach typical of the Klungkung Regency, East Bali. 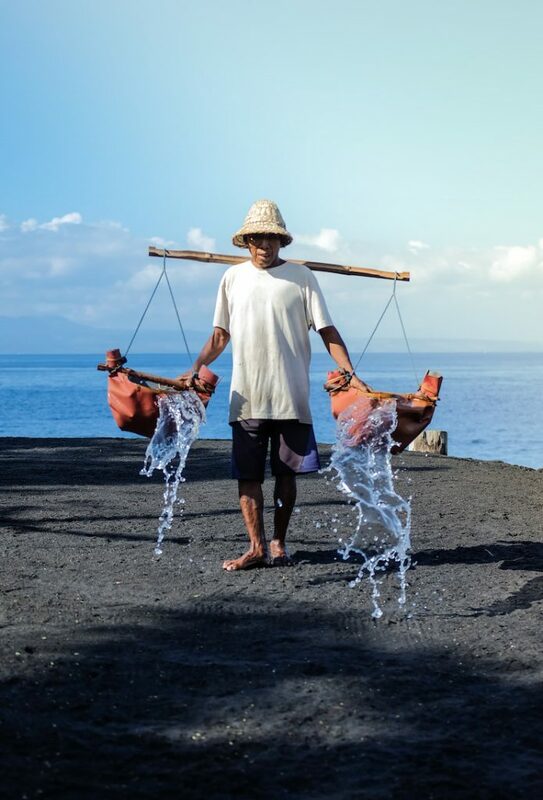 Nyoman carries two buckets crafted out of tarpaulin that cling onto a sturdy stick he then carries on his shoulders. An appropriate parallel to the hardships his ‘choice’ of trade gives people. There are very few Bali sea salt farmers left on the island. Many have long given up on the trade that gives sorrowful returns for such heavy work. Nyoman and his neighbours work from daybreak to sunset, their labour normally producing around 5 kilograms of salt if the sun is out — it’s a different story on a rainy day. Each kilogram they sell for around Rp.20,000 ($2). That’s $10 a day, but only if they’re able to sell. 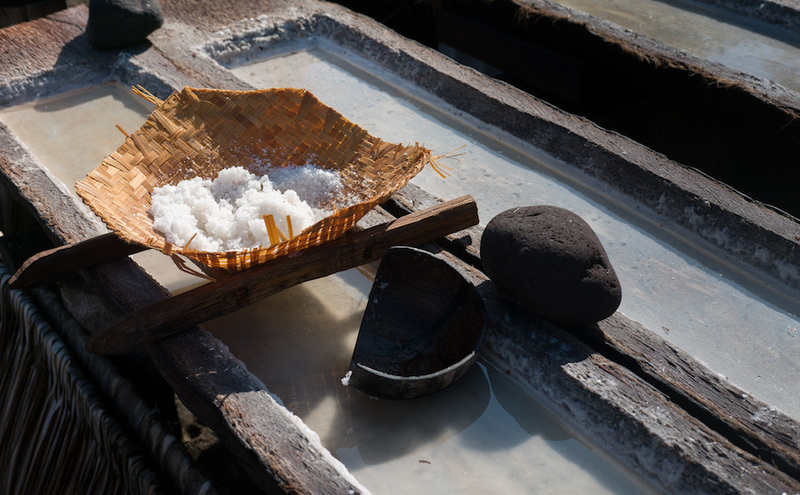 The process of farming, or harvesting, Bali sea salt is similar to the Agehama salt making techniques found in Japan, notably the Noto Peninsula. It begins by creating a flat, solid base of sand. The type of sand is important of course, and the fine black sands of Klungkung are perfect for it. The farmer then collects salt water from the sea, brings it to his flattened sand where he sprays the water along the top. He does this several times before letting the sand dry under the sun. When dry, he rakes the top layer of sand (now holding salt crystals after the water has evaporated) and collects it together, then dumps it all in a huge wooden box inside of his workshop. He then pours more sea water into the large box, which seeps through the salted-sand, increasing the concentration of salt in the water. The highly salt-concentrated water then pours out from the bottom of the box. When he has enough salt water, Nyoman will pour it into hollowed out tree trunks which he uses as drying racks. Here, on a sunny day, the water evaporates leaving salt crystals for him to scrape up, package and finally sell. As Nyoman Warta explains in the interview, it is a hard trade. Many of his friends have stopped and urge him to stop too. The returns are small for the amount of hard labour a farmer must put in. Of course, he does this for the betterment of his family; his children have gone to school and now take modern jobs – one as a security guard in Denpasar, for example. He doesn’t want them to lead the life he lives. But what about the Bali sea salt? Does it have a future? That is of course the question. 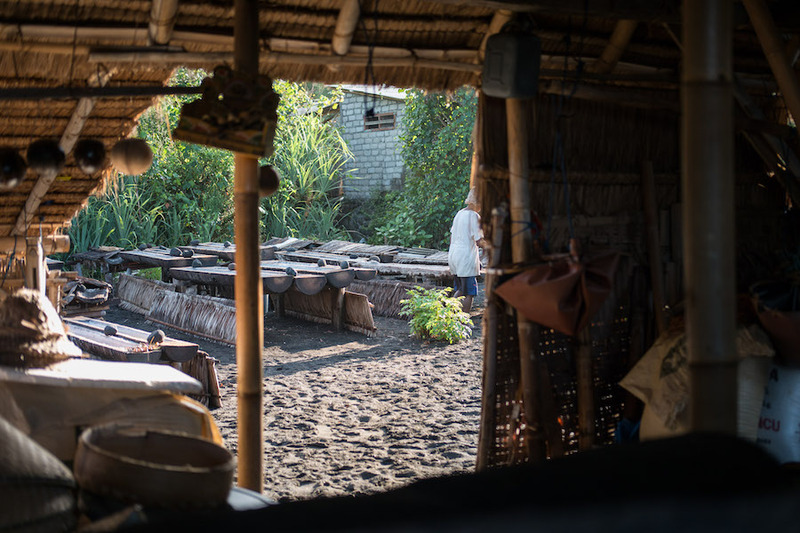 Nyoman and his few remaining neighbours don’t want to quit; the tourism industry has helped him, some hotels bring guests to witness the traditional trade, and many will buy salt from him. This is what keeps him and his friends going. But, without the next generation willing to take over, the future of the trade is in dire threat. 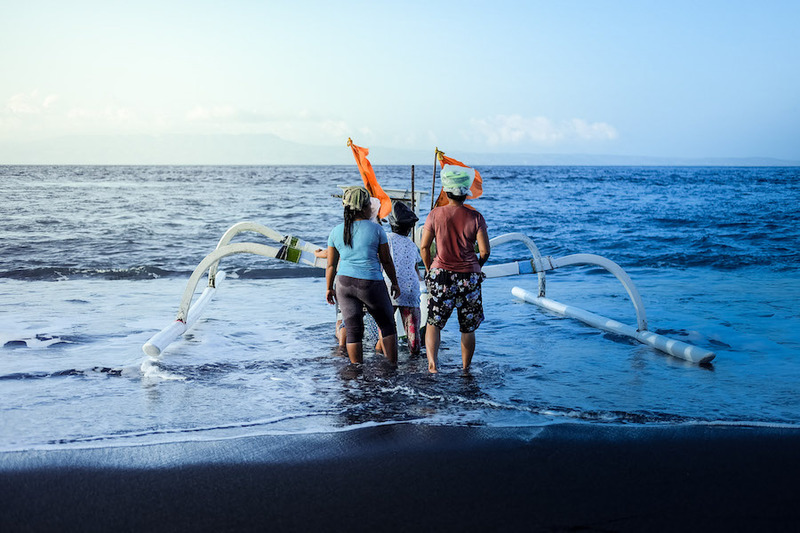 This may well be the final generation of sea salt farmers in Bali. Recently, the product has become popular among some of Bali’s top restaurants who have taken a turn towards locally-sourced produce, to improve taste of their dishes, help the local economy and reduce their carbon footprint. Perhaps the increase in demand (and hopefully price) may be enough to entice a younger generation of farmers to continue the trade. 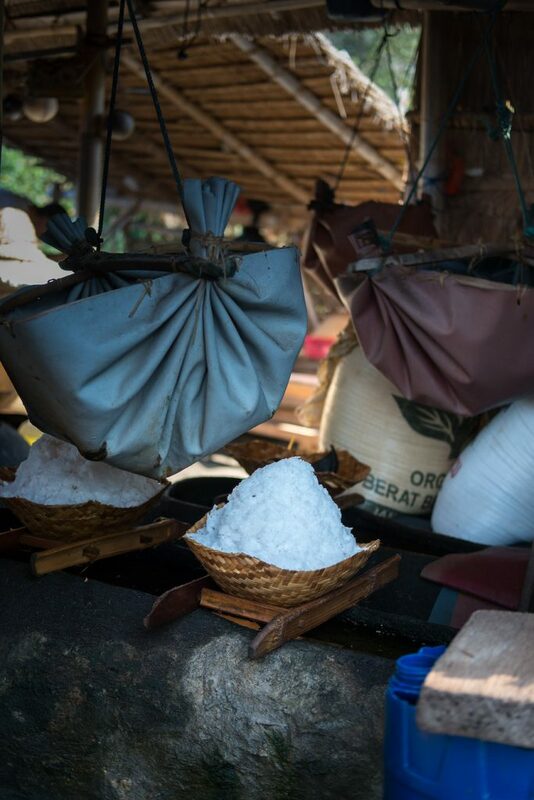 You can find Nyoman Warta and a few other sea salt farmers in the Dawan Village of Klungung Regency, East Bali. Just after the Goa Lawah Bat Cave, you’ll find a big parking area on the beach side. It’s best to park here and then walk up the beach (left facing the beach) until you see huts and wooden drying racks off the shore. Nyoman’s farm is the third one from the parking lot. Nyoman, and his neighbours, are very happy to welcome guests to take pictures, speak to him, and will even let you try scrape the sand our carry the sea water. You’ll see how hard it is then! Make sure to buy some of his salt from him, if possible give him more than asking price (Rp.20,000) to help and support him. Bali is home to artisans, hand-craftsmen and farmers, all of whom create special products here on the island. In NOW! Bali’s new mini-documentary series called ‘Made in Bali’, these products and their producers are put in the spotlight, with an aim to celebrate, capture and preserve their memory and to share them with culturally curious viewers from around the world. With a focus on cinematography and one-on-one interviews with the producers themselves, Made in Bali isa medium for these local artisans’ and farmers’ crafts to be noticed and appreciated. From carvers to farmers, harvesters and creators, many of these industries are in their ‘last generation’. As these men and women work hard to improve their standard of living for their children, they simultaneously remove the next line of succession to take on their skills, farms or workshops after they have gone. Documenting the various traditional skills that have existed for hundreds of years is a worthwhile project which NOW! Bali feels necessary to commit to. After all, who knows how long these producers and artisans will continue to exist. Subscribe NOW to stay tuned to more episodes of ‘Made in Bali’ .